Wait no longer! Pilgrim’s Merchant lunch, dinner and country store is May 2 & 3. Treat yourself, office mates, neighbors or a passerby to a delicious meal with all the fixings! 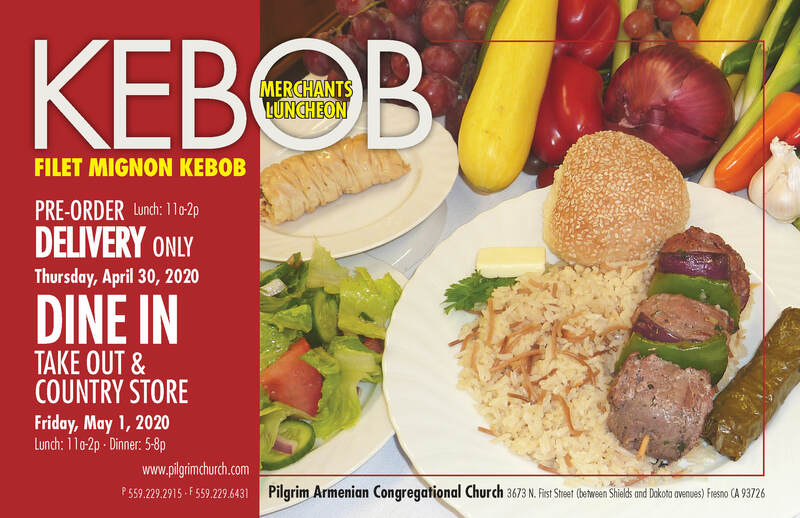 For $18, the meal includes a skewer of filet mignon kebab, Pilgrim’s famous pilaf, salad, fresh peda bread, yalanchi and Armenian bourma. Skipping breakfast is recommended. You can dine in or take advantage of the drive-thru and take-out options. On May 3, lunch will be served 11 am – 2 pm, dinner from 5-8 pm. For one day only, Thursday, May 2, you can have delivery from 11 am – 2 pm with a minimum order of 5. To order you can either call the office at 559.229.2915 or fax the downloadable ORDER FORM.